Here's another Flash Fiction Challenge sponsored by Patti Abbott. 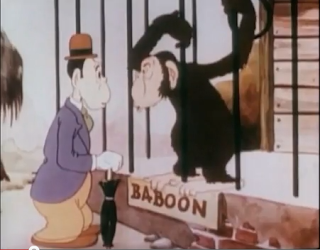 Write a short story on the them of "A Day at the Zoo." For more zoo stories covering a wide variety of moods, genres, and styles see the list posted at her blog. The polar bear was walking in circles again. The mountain lion was pacing. The South American tapir family was sleeping as usual. And the golden mantled tamarin was staring intently at the little girl. She was here again accompanied by the young woman with the strangely dyed hair making her look something like an odd species of tamarin herself. All that was missing were the bushy whiskers. The tamarin was perched quietly on an upper branch with its tail wrapped securely around the tree to keep it steady. It was still and good at listening. This is what it heard. "Let's go look at the penguins now." "You told me they make you laugh. I think they're funny. Come on, these primates are boring. And I don't want to accidentally see one masturbating like we did last time we were here." "They're sad. Everything is sad here. All the people are smiling and laughing but the animals look so sad. Or they're doing crazy things like the mountain lion we passed a minute ago or the polar bear that is always walking in circles." "It's their form of exercise." "That's stupid. You think I'm dumb because I'm nine. I know the difference between exercise and crazy. 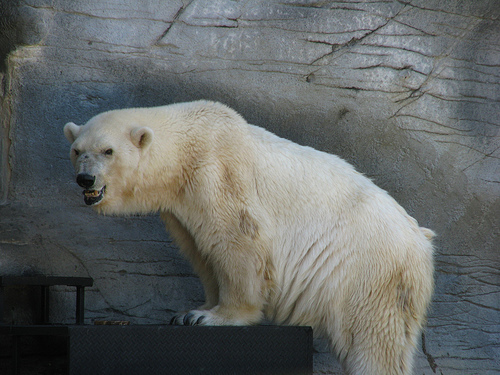 The polar bear is like that homeless guy we passed by the 7-11 who keeps scratching his head and screaming at invisible people. They're all sad or angry or something." "Animals don't have feelings, Sasha." The tamarin chattered loudly at that insulting remark. "People have feelings. Animals just... They just... live." "Then they should be happy. Who wants to be sad just living?" The tamarin peered intently at the young woman. "Animals just live. They eat, sleep and mate. That's it. No feelings involved." "If they mate then they get pregnant and if that happens then they have kids -- baby animals, I mean. Cubs, fawns, fledglings, whatever. And they take care of them. That's love, right?" "You didn't say anything about love. Are you pretending you don't hear me again?" "But sometimes you don't listen. My mom says there's a big difference." She made a noise of irritation then lowered her voice to a dulcet tone she perfected. She learned to master this hypnotizing tone when she wanted to make her point to the child. "Animals don't have feelings, Sasha. They are much less complex than people." Very loud chattering started coming from the glass enclosed cage in front of them. "Damn that thing is noisy! What I'm trying to explain to you-- Everyone is always anthropomorphizing animals. I blame Walt Disney for all of this." "Making animals seem like people. Like calling paws hands or seeing smiles in their expression when they're just chewing food or panting. And the worst of it is when people say they have feelings. The bear is not sad or mad or crazy because he walks in circles. It's just... a bear trying to get himself dry after swimming." "I bet the polar bear is mad that you're calling him all wet." "I think all the animals hate being here. 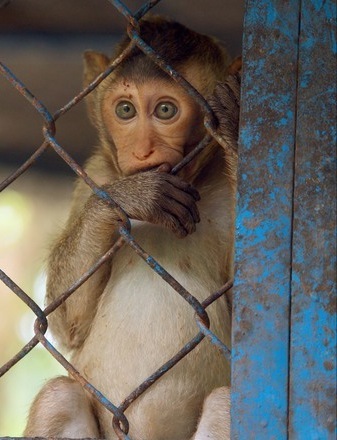 They wish they could have babies in the wild and catch their own food and be away from all these people." "See you're doing it right now. Animals can't wish! They don't have the capacity to imagine. They live in the present and only the present without any concern of the future. Only people can imagine." By now the entire cage of tamarins had exploded into a cacophony of dissent. "Animals imagine people in cages being fed by animal keepers. That what I think." The little girl was a psychic, the tamarin thought. Either that or a reincarnated ancestor. "I think we need to leave." "Hey! What's your favorite animal?" The noise stopped. The tamarin uncurled its tail, climbed down from its perch and placed its paws on the glass, once again peering intently at the young woman. It listened and dreamed of a response. I dare you. I dare you, it thought. "Just tell me your favorite animal." "OK. It's a...um... There! That's it right there. Looking at us now." The girl read the sign next to the enclosure. "Golden mantled tamarin. South America: Peru, Ecuador, Colombia. Near Threatened due to habitat loss." "Yes, the golden mantled tamarin. It's so strange. Right now it appeals to me." "Now would you want to be like that?" "In that glass cage with that guy coming in to feed you and wash your home with that giant hose and have all these people staring at you everyday." She laughed a high pitched titter. "It would sure beat having to watch you and deal with your parents who pay me my miserable salary as a 21st century Mary Poppins." "You're a smart aleck. I bet that's not even your favorite animal. And you'd never last a day here." The tamarin seemed to be grinning at them now. Oh keep going, keep going. "I bet I would. Be a snap. No worrying about a thing. Instead of being the caretaker I'd be taken care of. What a lovely role reversal. I'd bask in it." "Liar! I wish you were in a cage for a day. You'd hate it." "Not nice, Sasha. Let's go. Your Mom will be home soon." "I wish you were a tamarin for life! Then you'd see what I mean." "How was the day at the zoo?" "They have a new tamarin." 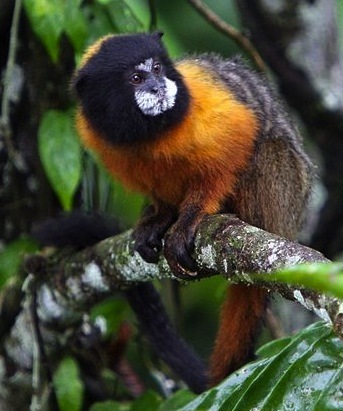 "A new golden mantled tamarin. It's near threatened. That's like two steps away from endangered." "This one has very funny hair. And another thing. It was the most angry animal in the zoo that day." "Sasha. Animals don't have feelings."